Last week I wrote a post about my excitement around the African musical permutations I was hearing this year in Trinidad’s Carnival. Since this week I was in Brazil for my first Carnaval Carioca, I wanted to also write about my experiences seeking out similar connections as a newcomer to this country. It’s no secret that Brazil is America’s largest African country. So as a DJ of African descent who specializes in the music of the Black Atlantic, I was excited to hit the ground here and experience the Brazilian Atlantic musical permutations first hand. I’ve come to find that while Brazil is a nation with a strong pride in its African roots, the continued role of race in the formation of country’s deep social divisions reveals some confusing contradictions. As the social reasoning goes in Rio, wealthier residents live in the formal city and are generally, but not always, white or light skinned. The residents of the informal favelas are mostly, but not always, dark skinned and of African descent. The marginal position that the favelas and their residents hold in society is reflected by the way their cultural production is treated. Funk Carioca is perhaps the cultural product that most represents life in Rio’s favelas today. According to my friend Maga Bo, it is also one of the most African manifestations in contemporary Brazilian music because of its roots in the Maculele rhythm of Capoeira. In Rio, it and its practitioners are constantly subjected to either attacks by the state, or not unlike hip hop in the U.S. – appropriation into the machinery of capitalism. This mirrors the twin processes of removal and gentrification happening to the favelas’ actual residents. Additionally, funk’s often vulgar lyrics and favela origins cause even some self-identified Afro-Brazilians to look down upon it. The marginalization of certain aspects of Afro-Brazilian culture, combined with my own status as an outsider, often leave me frustrated when seeking out Afro-Brazilian culture in the city. However, I didn’t know until recently that while Pedro did a great rendition, he didn’t write the song. The origins of the tune bring us back across the Atlantic to a Cuban composer named José Silvestre Méndez, and the great Beny Moré who recorded the song while on residency at a nightclub in Mexico. His version is likely the recording that made its way to Benin by vinyl LP, where Pedro picked it up. The trans-Atlantic connections of the melody (Portugal and Jamaica added to the list) now make it even rival ‘The Peanut Vendor’ in my mind. For me, such musical connections add a bit of the familiar to the unfamiliar, helping me sort through the confusion that is Brazilian identity politics. Sure, MC2K is singing about and showing off girls shaking their butts. But the fact that he includes Capoeiristas in a video for a song that uses Maculele, and samples a pan-Atlantic Afro-Brazilian roots song from Bahia, shows me that the underlying cultural connections aren’t totally lost on the “vulgar” and “low class” funk artists. I wrote last week that it seems like in the Caribbean older ideas of political pan-Africanism are fading, and contemporary Africa is providing new inspiration for a generation of globally aspirational cultural producers. On the other hand, in Brazil it seems to me that African-ness continues to be informed by ideas of national heritage and cultural roots. 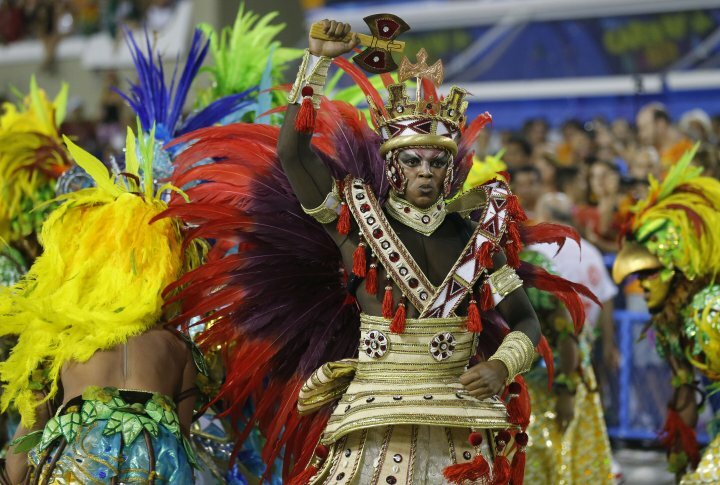 It wasn’t just Salguiero celebrating Africa at this year’s Carnaval competition in the Sambódromo, Brazil’s African heritage was and often is a recurring theme. However, this year the thread came up against an interesting juxtaposition with the prevalence of a theme similar to the one I was noticing in the Caribbean: the interrogation of Brazil’s position in the world. To me, these two threads symbolize the crossroads that Brazil is at just before it hosts FIFA’s World Cup. As more and more eyes look to the country, Brazil may have to find ways to reconcile the contradictions between their pride in their roots and their contemporary social divisions. In other words, like any global superpower, Brazil will have to figure out how to project all their confusing contradictions into our globalizing world.